HELLO everybody! It's been a long time, isn't it? I know that for sure, because words don't flow anymore, and my fingers feel like lead as I type these words. Gosh! It's been long. Just in case you were wondering what kept us away, Sunitha made her big move to Canada, yoohoo! I am happy for her, and I got real busy with the kids. You know how summer holidays can be, right?! Swimming and day trips, hikes, shopping, just feeding them kids and all the other things that come with the territory. But behind all the chaos of our lives Collaborative Curry quietly turned 2 ! Are we proud! It's been a great journey so far in the blogging world and we love all our readers for staying tuned to this site. I read all the lovely messages you left me, and felt quite touched that you remembered and thought about us while we were away. Love you guys! 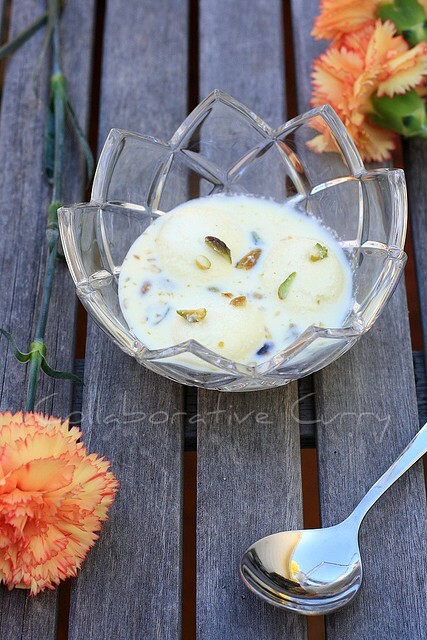 Today as we make a come back I will share an Indian sweet much loved, rasmalai. It's only been a couple of years since I started making Rasmalai. Infact, i never tried it while I was living in India. You know how you crave a piece of your country or hometown when you are far from it, right. That is how I made this one day. It goes without saying that I have a sweet tooth and this is one of my favorites. The 'mithai' shops in India sell these and they are awesome. If you haven't made this at home before don't shy away from trying, it's as a breeze. Watch this video from Manjula's kitchen it is really helpful to take your fears off. 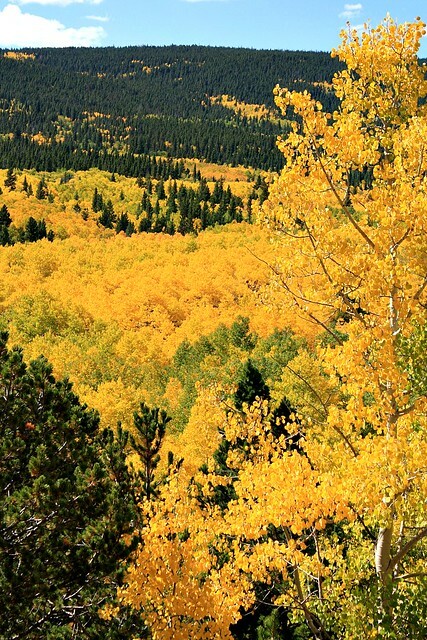 And here is a picture of "Colorado Gold" for you all :-) Happy Fall everyone ! 1.Boil 4 cups of milk, stirring in between. 2.Meanwhile mix the lemon juice with half cup of hot water. 3.When the milk starts to boil,slowly add the lemon juice mixed with water and stir gently.Turn off the heat and you should be able to see the curd and whey starting to separate. 4.Wait for a couple of minutes.Strain this using a strainer,lined with cheese cloth. 5.Wrap the paneer in the muslin cloth and hold it under running cold tap water for a few minutes. 6.Take out the excess water by squeezing the muslin cloth or by hanging the paneer in the muslin cloth for sometime till all the water drips off. 7.You could check whether the paneer is ready by taking a small piece onto your palm and rubbing with your fingers. After about 15-20 seconds of rubbing, if you are able to make a firm and smooth ball9without any cracks) out of the paneer,it is ready. 8.If the paneer is ready, place it on a surface where you can knead it. Knead the paneer for about 5-6 minutes or till it becomes smooth. 9.Make small lemon sized balls out of this and smooth them. (There shouldn't be any cracks)Press them between the palms to give them the shape of rasmalai. 10. Boil 4 cups of water in a big pressure cooker.Add 1 1/2 cup sugar and mix it. 11.Add the rasmalai patties and close the lid of the cooker.Keep it on medium high heat. 12.When the steam starts coming turn the heat to medium and cook for about 7 minutes. 13.Turn off the heat and wait for a few minutes before you open the cooker. 14.While you wait, boil the milk for the syrup in a non sticky pan and boil it till it reduces to almost half.Stir in between. 15.After opening the cooker carefully, take out the patties and gently squeeze them to get rid of excess water. 16.Throw in the sugar into the evaporated milk and mix well.Add the patties that you kept ready and cook for a few minutes. 17.Mix the soaked saffron and the powdered cardamom. 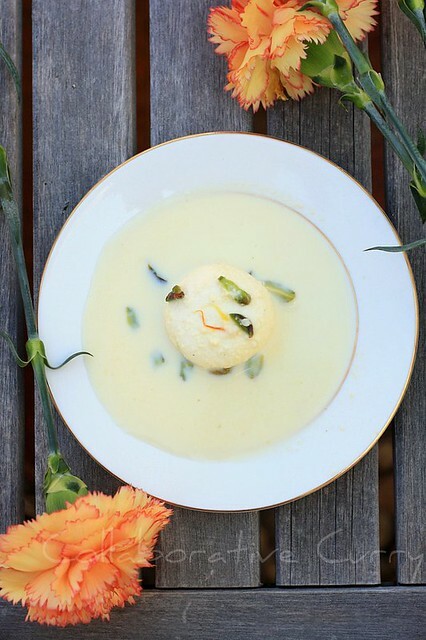 18.Pour the rasmalai into a serving dish, garnish with pistachios/almonds. Serve chilled. Nice to see you guys back ;)...Chechi , you have to make this or payasam when i visit you ;). and oh ! the fall colors....awesome! congrats on completing 2 years. the rasmalai looks perfect. Happy Fall to you Namitha! Congratulations dear! Tempting clicks of Rasmalai..And my my that Colarado gold autumn fall snap too is mindblowing!! Congrats to u both !! Adipoli fall analloo..evide ethra konum fall illa,infact eppol summer pole undu with 26- 27 degree c !! Congo to Collaborative Curry :)) And mouth-drooling ras malai...yumm yumm!! My first fav in dessert list. Congrats dearies.... way to go and wish u more milestones dear. shots are mindblowing as ever. My blog turned 2 last week and I have an array of giveaways esp for US residents - so please do echk it out and participate and once again, good to have you back! PS that is a terrific shot of the trees changing color! Firstly congratulations dear on completing 2 years. 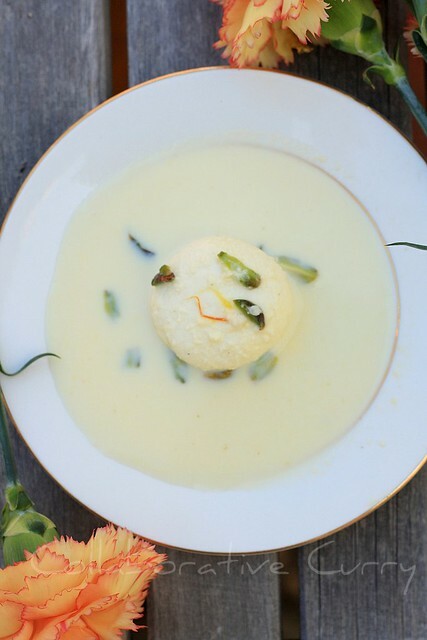 wow, that ras malai looks like the perfect thing to celebrate with. Welcome back! The dessert sounds awesome with saffron, pistachio, and almonds. Wish I can try some of it. Your beautiful fall picture is making me miss Colorado even more. It must be gorgeous up in Estes Park right now. Congrats on your 2nd Blogiversary! Hi, Ras malai looks awesome, I have been wanting to make this since a while now..my sister has become the recent expert of all bengali mithai..have to make soon and share with all my blogger friends..
awesome ras malai......nice clicks as well. welcome back dear....congrsts keep rocking! Congrats on the 2nd anniversary..gr8 job and just love ur blog. The rasmalai looks delicious...can relate to just how you would like to make all those dishes from scratch that were so easily available back in India. Only when one is away from home does one realize all the little things that meant so much. Welcome back and congratulations to both ofyou. rasmalai looks absolutely delicious....mouthwatering. Hi luv this Rasmalai with aperfect presentation.Luks lipsmackingly good and all other recipes too.Following U.
Congrats dear.. I stepped into your blog on an auspicious day!! Rasmalai as always looks sweet n Yummmy !! Gracias por su comentario en mi blog. Me ha encantado el Rasmalai una verdadera delicia,luce absolutamente bello y exquisito,preciosas fotos. felicidades por su aniversario de blog,que cumpla muchos más,felicitaciones,abrazos hugs,hugs. Absolutely delicious and mouthwatering. Congrats on your 2nd blog anniversary and wishes for many more to come. Happy Birthday to the blog and the rasmalai is oh so tempting. Looks super delicious!! Congratulations on 2 years, I just came to my 2 year blog anniversary too! So nice to see you back and continuing on. This looks so good and interesting I just have to try and make it. I love watching Manjula's videos...that's how I learned to make dosa! Thanks for sharing this recipe and the stunning Colorado gold! I don't get to see much of that here in Florida. Congrats! I love rasmalai but i have never made it at home. Always thought that it was not something i can dare to make it at home. I guess it's the time now. I know how life can get busy and it's good to take break and have all these fun while it's still sunny outside. Rasmalai is one of my fav and you made it so perfectly. ooh..rasmalai. How I love it! You know for the past one week I have been eating it every day! And I am not bored at all with it. Truly a classic bengali dish! Congratulations on completing 2 years of blogging and for Sunitha's move! Congratulations!Looks so heavenly! Rasmalai has been on my to make list for a while and I couldnt pull my guts together to make it. I guess I have a solid recipe here. Bookmarked. hey congratz and rasamalai looks so perfect..
Congratulations Namitha and Sunitha !!! A happy 2nd blog anniversary. Both of you done a great job with your blog. May the journey continue as you have succeeded in making the readers delighted with your posts, recipes and beautiful Clicks. Congratulations on your 2 years of blogging! happy 2 years! this month is also my 2nd year anniversary so our "babies" are of the same age!!!! Congratulations! A happy 2nd blog anniversary. I simply love rasgulla and rasmalai. They look so delicious. Congratulations on your blog anniversary, wishing you many happy blogging years ahead. The dessert looks awesome. Welcome back looking forward to your visit at@simply.food sometime. Beautiful photos! So glad to have found your blog full of gorgeous recipes and images. This dessert looks perfect for the hot summer days creeping up here.